Imphal: Loktak Lake is the largest freshwater lake in India's north-east, and it is now home to a floating laboratory that patrols its waters analysing pollution load to help conserve this biome. The 15-metre-long boat that can accommodate 10 people is a full-fledged laboratory made at cost of Rs 5 lakh. It cruises on the vast waters of the Loktak Lake analysing the water quality. Union Science and Environment Minister Harsh Vardhan told NDTV, "Loktak is a prestigious 300 square kilometre lake and we have scientists on board a boat who move around to collect samples from various parts." "This will help conserve the lake and contribute to scientific research and social responsibility," he said. The lake, which has shrunk by 40 sq km, is home to hundreds of massive circular rings of floating vegetation called "phumdis" or floating islands. Locals use them to culture fish, and about one lakh people depend on this massive lake. As a consequence, the pristine nature of the lake is getting lost. According to the Institute of Bioresources and Sustainable Development, the floating laboratory has all types of modern equipment such as water quality analyser, which automatically checks 14 parameters at a time such as temperature, acidity, salinity and electrical conductivity, among others. The five-person crew also collects samples of microorganisms which might have a potential application in pharmaceuticals, nutraceuticals and other industries. A part of the massive lake is conserved as the Keibul Lamjao National Park, the only floating national park in India, says Dinabandhu Sahoo, director of the institute based in Manipur's capital Imphal, 55 kilometres from Loktak Lake. 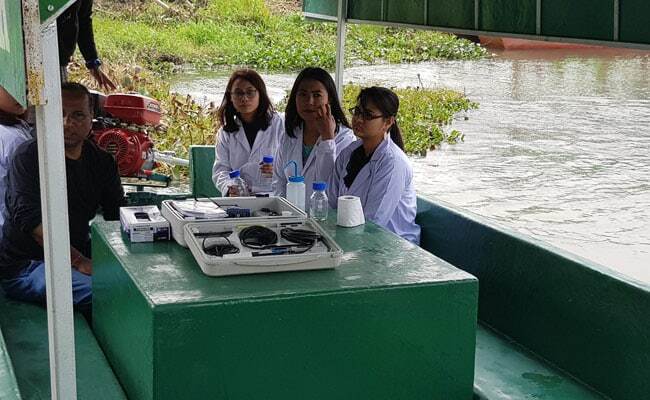 The floating laboratory on Manipur's Loktak Lake has all types of modern equipment such as water quality analyser. On this floating vegetation lives an endemic species of deer called Sangai, and only a little over two hundred individuals of this endangered survive in the wild. Mr Sahoo is the person who conceived the idea of the boat. "The pollution level has increased in the lake. The oxygen level is also varied, the pH (acidity) level has also substantially gone down and water is turned in some parts acidic and in others alkaline," he said. Sahoo is a veteran of working on boats and in 1987 had travelled to the Antarctica on a ship, so it was not difficult for him to put the idea into practice. The all-women team of young researchers makes it the effort even more significant. Insurgency is still active around these parts and armed commandos protect the head of the institution. This is undoubtedly an effort by the Department of Biotechnology of the central government to protect this unique ecosystem of the Loktak Lake. Sahoo says this habitat for the Sangai deer is under threat due to lack of indigenous feed. Pollution and other interference in the lake have affected the animals.